A 6 year old girl of Nigerian extract presented with a three month history of tender lesions on the backs of her legs. Some of these lesions had superficially ulcerated (fig 1). She also had a non-painful red right eye for approximately one month. Area of shallow ulceration on medial aspect of left leg. She was born in Nigeria, having arrived with her family in Ireland the previous year. She received the BCG vaccination in Nigeria. She was systemically well, afebrile, with normal growth parameters. No-one in her immediate family had any evidence of active tuberculosis. She had a nodular episcleritis in her right eye which responded to beclomethasone drops. A 2TU tuberculin skin test performed on admission was very strongly positive with an area of induration in excess of 3 cm in diameter. This later blistered and ulcerated. The skin lesions fitted the description of erythema induratum of Bazin (EIB), one of a group of cutaneous hypersensitivity reactions to internal tuberculosis infection known as tuberculids. This was confirmed by histological report on a punch skin biopsy which revealed the classical granulomatous dermatitis and lobular panniculitis (fig 2). No organisms were seen on staining, and polymerase chain reaction for tuberculosis was negative. A chest radiograph was normal. Skin biopsy from leg lesion with granulomatous inflammation and panniculitis (H & E, 100×). EIB is uncommon in children, but cases have been reported even in infants.1 Unlike erythema nodosum, it occurs more often on the posterior aspect of the legs, can ulcerate, and typically has a more prolonged course.2 It necessitates a thorough investigation for tuberculosis and responds well to appropriate antituberculous medications. Chang MW, Lawrence R, Orlow SJ. Erythema induratum of Bazin in an infant. Pediatrics1999;103:498–9. McNutt NS, Moreno A, Contreras F. Inflammatory disease of the subcutaneous fat. 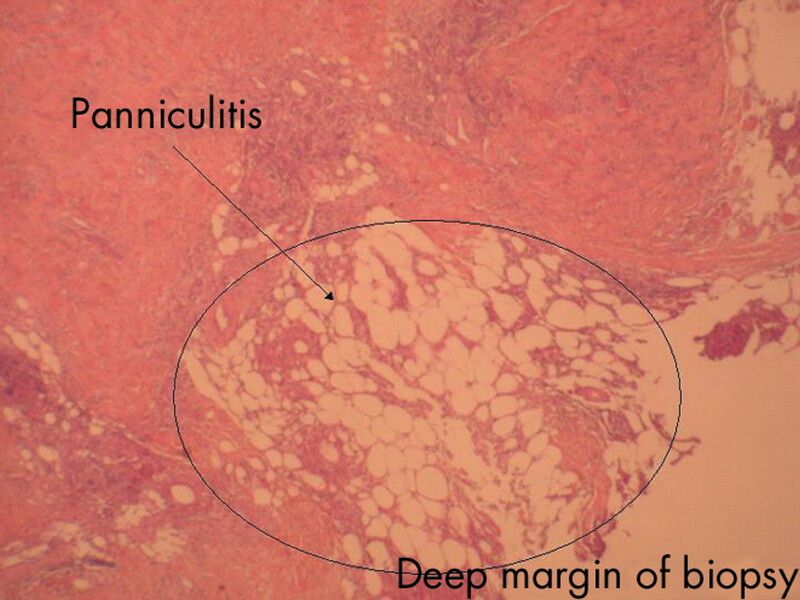 In: Lever’s histopathology of the skin. 8th edn. Philadelphia, PA: Lippincott-Raven, 1997:429–40.